I love this table! It comes in a muted black and looks just like the photo. It fits perfectly next to the bed in a small space; and definitely enhances the look of the modern decor. The table is sturdy, modern and nicely minimalistic. 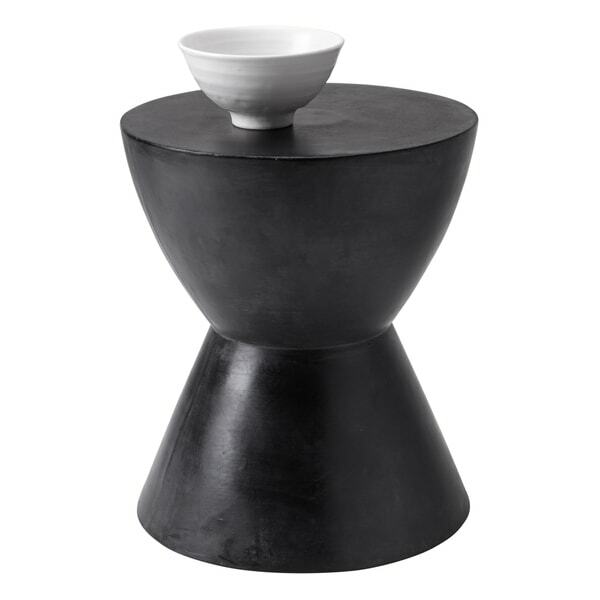 Modernize your space with this striking end table. Made of sealed concrete, this end table combines crisp monochrome color with an abstract, sculpted design to create a dramatic industrial look. Perfect side table. Item is heavy ceramic, very well packed. Not easily turned over by a child. Needed sturdy end tables for the deck to withstand high winds. I bought two in white and they fit the bill. Perfect height and easy to clean. You can even use them for extra seating. Super fast shipping too. I really love the look and heft of this table. We have big dogs and they won't knock it over easily if they bump into it. The finish is fabulous in that it's not shiny or ultra-modern. It's a bit matte without any flaws which I really love. My only complaint is that it's not a couple inches taller. 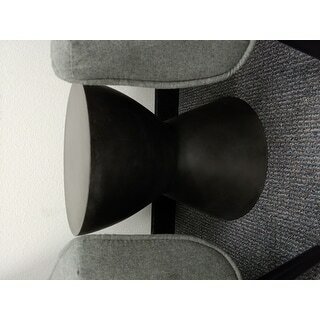 I knew the size when I ordered it for use as a side table next to the sofa in a small space but it would be nicer and more height appropriate for a side table if it was about 3-5 inches taller. It's a great accent piece and goes well with a variety of decor styles. It is heavy and well-constructed. It would just be even better if it were taller. Other than that - no real issues - looks great and is the perfect compliment for our home. I absolutely love this end table! I have the grey one, and I use it for one of my small lamps that has a round bottom. It goes perfectly with my modern decor. Perfect size to place in corners and small spaces. using it in contemporary styled living room. It functions as end table and extra seating. Logan end table exactly as pictured/described. (No kidding, it weighs a ton!) Not large, but has nice visual impact. This is a very sturdy side table which is the perfect addition to my great room as a small side table. I was expecting it to be metal, but it was some type of ceramic. It seems to be high quality and I would purchase it again. I love this table! I bought one for a client to use on her patio, and now I want one for myself for my family room. It can work indoors or out. Love this item! 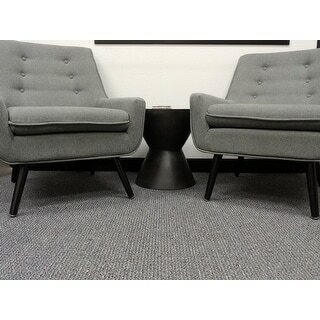 Purchased 2 used them for side tables in my living room! Gotten so many compliments! Great modern look ! Highly recommended!! Very modern, great quality. Read some mixed reviews but thought I would give it a chance and I just love it. Dimensions are accurate, decent weight so will not topple over. I use this in an office and it adds the perfect touch. Would recommend and considering purchasing a second for home. These came in quite damaged. They were broken in the box and had to return a few of them. It's too bad because they looked really nice but I couldn't risk having more broken ones come in. The tables arrived promptly and in good condition. They are pretty much as I had hoped - perhaps not quite as polished a look as I was hoping for, but overall a nice product that fits n well with my furniture. Simple and stylish. I needed a contemporary table for a lamp in my living room and this is perfect! "Can this be used outside on a patio?" The product is sealed concrete and could be used outside. "Can you sit on this as well and use as a stool?" This item is recommended to be used as an end table.